We here at Malloy Ford of Winchester love all of the tech features about the Ford Fusion, but every array of tech features has standouts. After much discussion, here our favorite two: Your personal in-cabin Wi-Fi network and satellite radio with up-to-date traffic. Enjoy AT&T-powered 4G LTE speeds with the Ford Fusion's in-cabin Wi-Fi network. The network supports 10 devices and extends up to 50 feet. Now your passengers can surf, stream or download during daily commutes, weekend trips, tailgating parties or long summer afternoons at the beach. Fusion comes with a five-year complementary trial of SiriusXM Travel with Travel Link. The package includes 150 channels of news, sports, music, entertainment and commercial-free content. It also includes detailed travel, such as weather, gas stations, gas prices and turn-by-turn voice-guided directions. The directions are linked to GPS displayed on a 3D map to give you a more accurate view of routes and landmarks as you're driving. 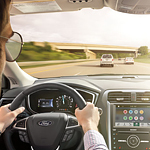 See the Fusion's tech features for yourself with a test drive today at our Ford dealership.